The real estate and financial crisis of the mid-2000s hit homeowners hard. By 2010, hundreds of thousands of American families had been foreclosed upon, and banks and other financial intermediaries were in possession of hundreds of thousands of single family homes. These bank-owned homes – dubbed “REO” (real estate owned) by industry professionals – put banks in the uncomfortable position of being landlords for hundreds of thousands of properties. Nationally, banks owned approximately 500,000 homes at any given time between 2008 and 2012. Georgia was one of the hardest hit states, and at this writing remains one of the top five states for foreclosures and bank-owned properties. At the peak of housing distress in 2012, two government entities responsible for supporting mortgage markets, Fannie Mae and Freddie Mac, owned tens of thousands of homes nationwide with more located in Atlanta than any other city. Over the past few years, policy makers and industry professionals have pursued an array of responses to the crisis. This essay traces the development and impact of one approach: Single Family Rental Securitization (SFR), a financial product developed to help convert lender-owned homes into rental properties. How was this new product created, how was it used in Atlanta, and how did it affect the housing market crisis, particularly in Gwinnett County, where much of the investor-owned rental activity is occurring? 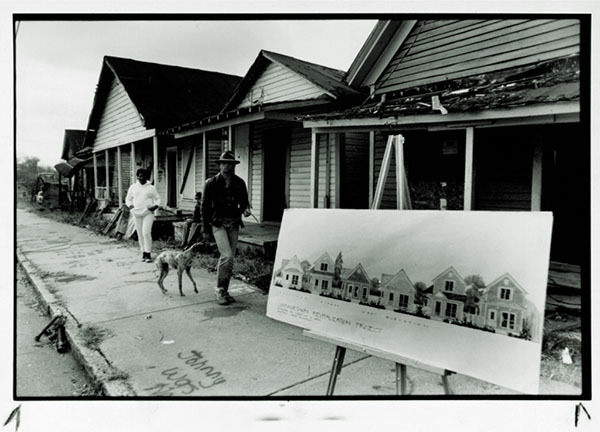 At several key points during the development of SFR, government agencies like Fannie Mae and private firms like Blackstone had to decide whether to encourage neighborhood stabilization and rehabilitation of distressed properties, or whether to maximize return on investment. 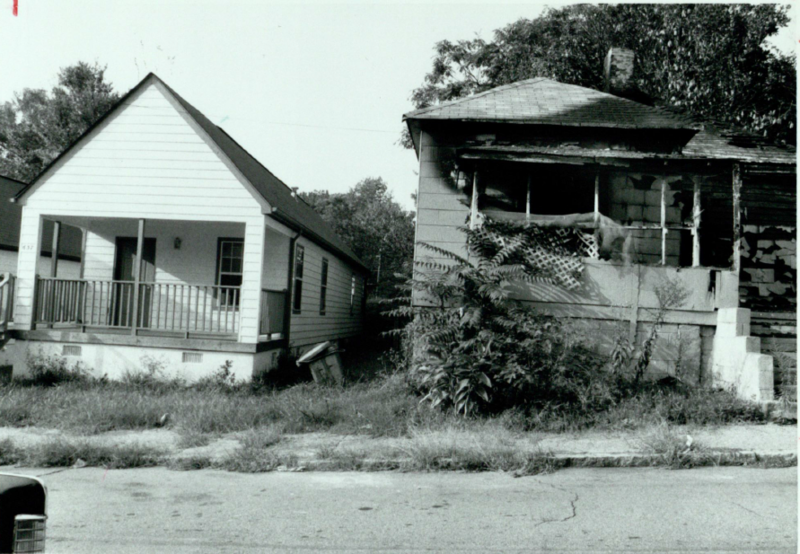 These decisions helped shape Atlanta’s uneven housing market recovery. ID: atlpp0296_6, Planning Atlanta City Planning Maps Collection, Georgia State University Library. At first, private equity firms paid cash for homes. But in 2013 they began using a new type of finance: Single Family Rental securitization (SFR). Atlanta was one of a handful of cities that held great attraction for corporate landlords, and from the very beginning, Atlanta properties were used to test and develop this product. Similarly, the first successful SFR securitization packaged several hundred Atlanta homes into an investment vehicle that was sold to investors. Single Family Rental securitization was developed and brought to market over a three-year period by a coalition of government, non-profit, and private sector actors. Development began in 2010, a few years into the housing crisis. At that time, Fannie Mae and Freddie Mac sharply increased their REO sales, and Fannie Mae announced its intention to sell off its massive portfolio of single-family homes. The prospect of bulk sales sparked discussion in the financial industry about how private equity could play a larger role in the single-family market. 3 Non-profits hoped that Fannie Mae and Freddie Mac, as government agencies, would dispose of their tens of thousands of bank-owned homes with conditions that would encourage buyers to improve economic conditions in the cities and neighborhoods suffering the most. Private investors were interested in buying real estate at rock-bottom prices, but were unsure of how to structure the deals. Further, it wasn’t clear if rental management firms could profitably service scattered-site rentals. Managing an apartment building with one roof and one boiler system was a well-known proposition. By contrast, monitoring and maintaining thousands of single-family homes spread out over a sprawling region like Atlanta presented a brand new set of challenges. Solving these puzzles involved discussion and experimentation, which was coordinated by the Fannie Mae and the Federal Housing Finance Agency. Early in 2012, the Federal Housing Finance Agency (FHFA), in its capacity as conservator for Fannie Mae and Freddie Mac, solicited proposals for advice on how to structure transactions with investors. 4 Proposals came from every segment of the housing market; real estate agents, mortgage brokers, large banks, small banks, affordable housing advocates and community groups responded. Several proposals pointed out that the foreclosure crisis was concentrated in minority neighborhoods where subprime lending had been the most intense. These proposals asked that Fannie Mae and Freddie Mac use their clout to pursue neighborhood stabilization and repair the hardest hit housing markets. This set of proposals asked FHFA to take strategic actions to repair distressed neighborhoods rather than focusing on recovering the strongest prices for each individual home. Many non-profit proposals encouraged FHFA to cross subsidize properties, by offering to sell bundles of houses to investors paired with affordable housing advocates. 5 Others encouraged FHFA to construct bundles of homes that mixed strong and weak properties, and to prevent resale for a certain period of time. This would prevent new owners from failing to maintain properties and then when decay set in, dumping the weakest properties, particularly in neighborhoods that were already struggling. But instead, in the fall of 2012, FHFA chose a different path. Their solution was created to recover the highest possible price for the properties. Unfortunately, the goal of helping the hardest hit neighborhoods was not well served because buyers were permitted to dump poorly maintained properties back on the market, and then focus on purchasing homes that were the easiest to maintain and easiest to sell. Further, FHFA constructed groups of rental properties that were so spread out they would be difficult to maintain. Community activists and non-profits feared these practices would lead to abuses and concentrated blight. Now armed with an approach, Fannie Mae launched a pilot and assembled several portfolios for sale: one in Chicago, one in Atlanta, one in Florida, and others in Sunbelt cities across California, Arizona and Nevada. Fannie Mae had thousands of REO homes in rust belt cities but these areas were not included: a market-based solution would exclude areas where population is declining and where neither home prices nor rents were expected to rise swiftly as the general economy improved. Atlanta was the city included in the pilot with the weakest rental prices, and the properties in the Atlanta area did not sell. The exclusion of rust belt cities, and the inability of Fannie Mae to sell the Atlanta homes was the first of many indications that the market-based strategy for bulk sales selected by the GSEs was likely to exacerbate the uneven housing market recovery. The program would channel high volumes of private investment into places doing marginally well, promoting a swifter recovery for the moderately hard hit, while doing little or nothing for the hardest hit areas. Although Fannie Mae’s pilot did not succeed in Atlanta, in 2012 and 2013, private industry discussed how to build upon Fannie Mae’s pilot program, and the next product was used for bulk sales of Atlanta homes. Discussions about the rating and pricing of a SFR security focused on three uncertainties: housing market risk, property management risk, and ambiguity about the best structure for single-family securitization. A key question was whether the ownership of the homes should remain with the borrower in a securitized transaction, as was done in the Fannie Mae pilot, or whether it should be transferred to the security itself, giving investors a stronger standing to foreclose in the event of bankruptcy or default but consequently weakening incentives for good property management. In spring of 2013, Blackstone, the largest and one of the earliest institutional investors in distressed single-family homes, began preparing an SFR securitization. The Invitation Homes 2013-SFR 1 was issued in November 2013 and had strong investor interest. The security was backed by 3,207 single-family rental homes in the cities where the economic outlook was generally positive and REO were concentrated: Phoenix, AZ, Riverside CA, Los Angeles, CA and Atlanta. The security was worth a combined total of $479.1M. Deutsche Bank arranged the deal; served as loan originator, seller, depositor; and placed certificates. Their fee was $7.9 million, or around $2,500 per home. Once the structure of this new product was developed and proved successful, it became popular. As of April 2015, 16 similar deals totaling $8.8 billion dollars have been executed. Because the security emphasized the importance of home value, rather than maintenance costs or rental revenue, there was pressure for investors to purchase the most valuable, easiest to sell properties, thereby leaving the market with higher concentrations of more distressed properties. This pattern can be seen by reviewing Blackstone’s activity in Gwinnett County. Gwinnett County is a microcosm of the flurry of REO-to-Rental activity that took place around the country. The county had high volumes of clustered foreclosures, much of the housing stock is brand new, but overall the county is less hard hit than other areas in Atlanta and the long term economic strength of the area remained intact. This combination of factors is extremely attractive to private equity investors, who flooded Gwinnett from 2013 onwards seeking to buy foreclosed homes, while avoiding other areas with high rates of foreclosure entirely. Blackstone, the largest REO buyer in the United States and the first to issue a SFR securitization product, owned 938 single-family homes in Gwinnett County as of June 2013. The average value was assessed as $120,410; the total value was $112.9 Million. 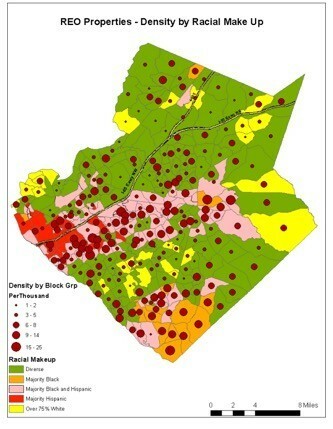 A review of the properties that Blackstone/Invitation Homes incorporated into their SFR security shows that the largest concentration, 30%, were in Gwinnett County. These numbers were provided for tax purposes. The appraised values included in credit ratings for the Georgia properties are roughly double the total of this column. 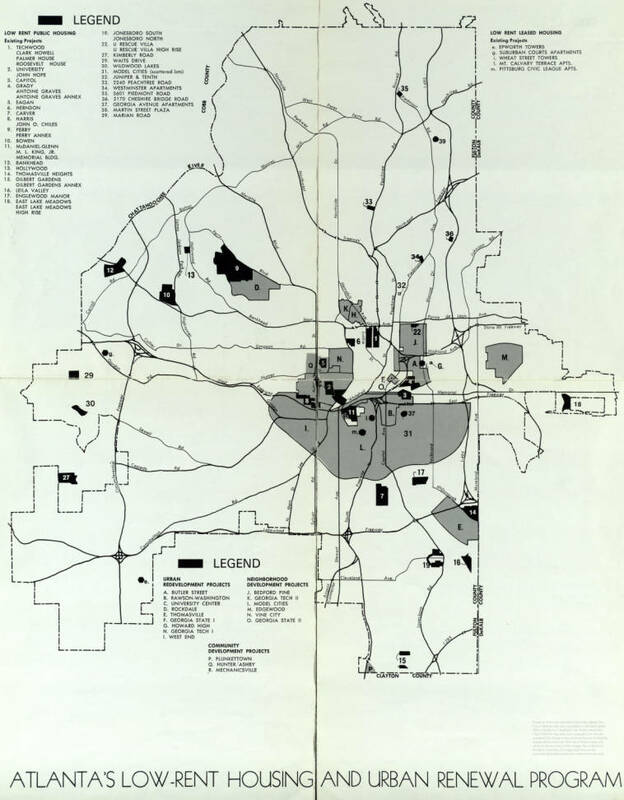 This uneven pattern of rehabilitation and investment took place between counties, and also within Gwinnett County itself. 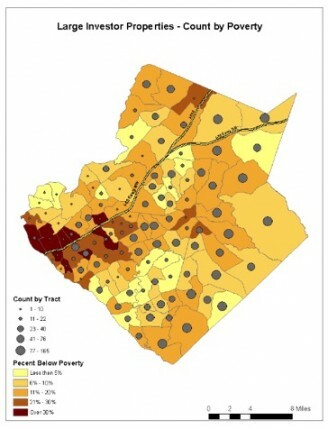 As of summer 2014, bank-owned properties in Gwinnett were concentrated in moderate-income, majority Black and Hispanic census tracts: along a corridor just south of the highway, and the southernmost point of the county. However, Blackstone, like other institutional investors, avoided purchases in high poverty areas, particularly the eastern border. And, just a year later, Blackstone announced it was selling 1,300 of its least valuable homes in Atlanta. The average value of the properties Blackstone-Invitation Homes sold was very low – just $85,000, and are described as being in poorly performing school districts. 7 This kind of investor activity is one reason why Atlanta’s housing market recovery has been very uneven. Places that were moderately hard hit have received investment, rehabilitation, and buyer interest. Foreclosures and vacancies have declined, and prices have recovered to 2000 levels. But the neighborhoods with the highest levels of distress remain mired in crisis. Maps by Jesse Zaro Moore (2014) “Mapping Patterns of Behavior of Investors in Single Family Detached Residential Properties in Gwinnett County, 2013.” Used with permission. Atlanta is one of a handful of cities with strong investor interest in REO, and Single Family Rental Securitizations. We see within Gwinnett County that the unconstrained, market-based recovery has resulted in purchases clustered in higher income areas, where lower income areas are left without investment. This pattern is true throughout the city. Nearly a decade since the crisis began, most of Atlanta has recovered, but there remain highly concentrated areas of vacant, lender-owned homes, and depressed prices, where nearly 60% of remaining homeowners owe more than their home is worth. Historically, organizations like FHFA and Fannie Mae have shaped housing markets with homeowners in mind. For generations, these institutions invented and standardized financial products that made housing affordable, and enabled middle class homeownership. These institutions remain uniquely poised to initiate and shape the financial industry’s response to the crisis, particularly since the housing crisis left FHFA in control of swathes of single family homes. But the financial product developed by FHFA-Fannie Mae, and perfected by Blackstone–Invitation Homes relies heavily on home price appreciation with less focus placed on rental revenue and maintenance, and no emphasis on neighborhood stabilization. As housing advocates and affordable housing non-profits feared and warned, this decision encouraged investors to purchase and maintain the best homes, while neglecting to maintain others and eventually selling those degraded properties off. In Atlanta, the effect has been to exacerbate existing inequality, and concentrate housing market distress. 1. ↵ See Dan Immergluck, Foreclosed: High-Risk Lending, Degregulation, and the Undermining of America’s Mortgage Market (Ithaca: Cornell University Press, 2009) and Jacob S.Rugh and Douglas S. Massey, 2010. 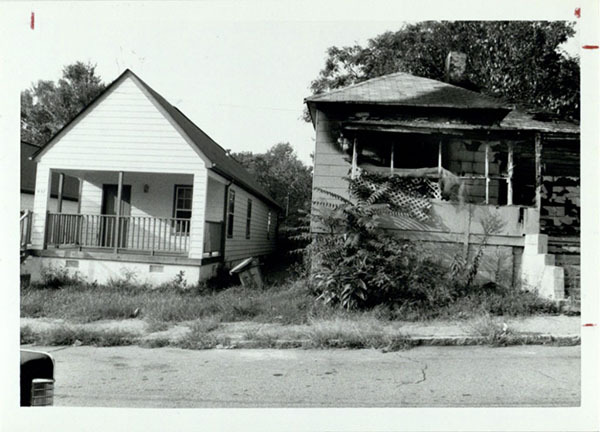 “Racial Segregation and the American Foreclosure Crisis”. American Sociological Review 75 (5): 629–51. 2. ↵ See John Gittelsohn and Heather Perlberg, “Blackstone’s Home Buying Binge Ends as Prices Surge: Mortgages.” BloombergBusiness. March 14, 2014. Accessed January 26, 2016. http://www.bloomberg.com/news/articles/2014-03-14/blackstone-s-home-buying-binge-ends-as-prices-surge-mortgages. 3. ↵ Nora Colomer, “REO to Rental: Closer, but No Securitization.” Assest Securitization Report. February 4, 2013. Accessed January 26, 2016. http://www.structuredfinancenews.com/issues/13_2/reo-to-rental-closer-but-no-securitization-237390-1.html. 4. ↵ Matthew Clark, Own-to-Rent: New Approach to Overflow REO Gaining Attention. May 3, 2012. Accessed January 26, 2016. http://www.crunchedcredit.com/2012/05/articles/foreclosure/own-to-rent-new-approach-to-overflow-reo-gaining-attention/. 5. ↵ David Abromowitz and John Griffith, “Rehabilitate to Rent: Focusing Resources to Rebibe the Housing Market.” Center for American Progress. October 12, 2011. Accessed January 26, 2016. https://www.americanprogress.org/issues/housing/report/2011/10/12/10426/rehabilitate-to-rent/. 6. ↵ Colomer, “REO to Rental: Closer.” Moody’s Global Credit Research, “Single-Family Rental Securitization Structures Without Mortgages Would Increase Risk.” Alacra Store. January 17, 2013. Accessed January 26, 2016. http://www.alacrastore.com/moodys-credit-research/single-family-rental-securitization-structures-without-mortgages-would-increase-risk-pbs_sf314575. See also: Christina Mlynski, “Moody’s: Single-family rental equity secruitization poses more risk.” HousingWire. January 18, 2013. Accessed January 26, 2016. http://www.housingwire.com/articles/moodys-single-family-rental-equity-securitization-poses-more-risk. 7. ↵ Ben Lane, “Altisource Residential triples rental portfolio in massive deal with Invitation Homes.” HousingWire. August 12, 2015. Accessed January 26, 2016. http://www.housingwire.com/articles/34751-altisource-residential-triples-rental-portfolio-in-massive-deal-with-invitation-homes. Heather Perlberg and John Gittelsohn, “Blackstone Selling 1,300 Atlanta Houses in Strategy Shift.” Vers. Updated. BloombergBusiness. July 13, 2015. Accessed January 26, 2016. http://www.bloomberg.com/news/articles/2015-07-13/blackstone-selling-1-300-atlanta-houses-in-strategy-shift.